Bags, pouches, appliances....whatever you choose to call them, come in many shapes and sizes. The trick is to find the right one for you and your skin type. For the purposes of this page, I'll commonly refer to them as bags, because that is exactly what they are! I have heard stories of people using tins, rubber gloves, and even coconut shells over their stomas to collect the waste products. I've even heard a story of one ostomate who used to sleep on their stomach at night with their stoma strategically placed over a hole in the mattress with a pot underneath catching the waste products! Thankfully, these horror stories are a thing of the past for most ostomates. Today's bags are thin, lightweight, odour proof and have a very low profile once you're wearing them. The kind of bag you will need depends on the type of ostomy surgery you have had. In some cases, you will not need to wear a bag at all. Whilst you are in hospital and when you first leave the hospital, you will probably have a clear bag. The only advantage to clear bags is that your doctors and nurses can see what's happening in the bag without removing the whole thing. Once you come home, you'll probably want to switch to opaque bags - after all - who wants to see what's happening in there? People with an ileostomy need to wear a bag on a full time basis. This is because you cannot control when the stoma is going to work - in fact it will probably work 95% of the time! It is therefore, essential that you find an appliance system that suits both your skin type and your lifestyle. You will have the choice of either a one- or a two-piece system. There is no better system - it is simply a matter of what you prefer. Both types are drainable, meaning that you can undo the tie or clip at the bottom of the pouch and empty it as needed. Bags can also be disposable (ie are thrown away once they are finished with) or reusable. There are also some non-adhesive systems available which do not have a wafer which adheres to the skin. These are especially helpful for those who have problems with allergies from the wafer material. A One-Piece System is designed to be disposable (this does not mean that they can be flushed down the toilet - most toilets react very badly to having plastic bags flushed down them!). A one-piece system is just that - one-piece. It means that the wafer (the part that attaches the bag to your skin) and the bag itself, are all in one and cannot be pulled apart. Some one-piece bags may come with tape around the wafer designed to help the wafer stick better. However, many people discover they are allergic to the tape and cut it off. This is perfectly acceptable and will not interfere with the wafer sticking in any way. Two-piece Systems means that the wafer and the bag are separate and are joined together by what is commonly referred to as a "tupperware-type ring" on the wafer. The wafer is designed to stay put for a while and the only thing that you will need to change on most occasions is the bag itself - just attach the new bag to the wafer. Two piece bags can either be disposable or reusable. If the bags are reusable, the ostomate usually has about two or three bags which can be rotated in wear time. The used bag is cleaned, dried and aired then reattached later on when needed. This has the advantage in that if you pay for your ostomy appliances, it is a huge saving not having to buy new bags for every change, although eventually the bags do wear out and you will have to splurge occasionally. One-piece systems are very quick and easy to apply (a distinct advantage for those with arthritis, etc). One-piece systems are a little less bulky than the two-piece system as they do not have the "tupperware ring" to contend with. With a two-piece system, you can easily change your bag depending on the need without changing the wafer as well, ie you may want to change to a mini-bag for intimate moments or swimming, with the minimum of fuss - it is not possible to do this with a one-piece system unless you change the whole appliance. Two-piece systems are a little easier to "burp" when the need arises - you just lift the bag from the ring and let the excess gas out. You can burp your bag with a one-piece system by undoing the clip and letting out the gas but a little more care is needed in case more than gas comes out! I would advise "burping" your bag only if you are the only one in the room - the resulting odour can be a little over-powering! Two-piece system bags can unattach themselves from the wafer at times - esp if the bag becomes too full or if the bag wasn't attached properly in the first place. This is what is commonly known to ostomates as a "blow-out". Both systems come with both pre-cut openings in the wafer and those that you have to cut yourself. At first, it's probably better to go for the ones you have to cut yourself as you stoma will change in size considerably during the first 6 months or so of it's life. Once your stoma has settled down, you can opt for pre-cut appliances to save you time when changing. 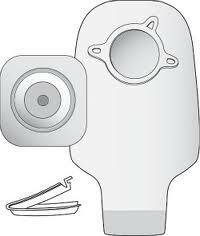 It depends on the system you use as to how large you cut the hole, ie with Stomahesive it's recommended you cut the hole in the wafer 1/8" larger than your stoma - for most others you should cut it the same size as your stoma. In addition, many people's stomas are not a perfectly round shape and the pre-cut wafers may not be suitable for them. For those colostomates who don't irrigate, the choice in bags is the same as for ileostomies above. However, for those who do choose to irrigate, once you have your routine down pat, you probably won't have to wear a bag full time. Most times you will probably only need to wear what's called a "stoma plug" over your stoma or if you prefer, a small bag as for ileostomates but it need not be drainable - it will have a closed end. If you do irrigate, you will need to get hold of some special equipment. On average it takes approximately an hour a day to irrigate but it does mean that usually you don't have to worry about your stoma for the other 23 hours of the day - or longer if your stoma allows it. To find out what it means to irrigate, check out Mich's Article on Irrigating . However, your stoma nurse will be the best person to tell you what you need and how to perform the irrigation. If you choose not to irrigate that is perfectly acceptable, just be aware that you do have the choice. Urostomates need to make sure that their kidneys are functioning smoothly at all times. The kidneys in a urostomate are prone to infection because there is more chance of the urine backing up into them - and urine is full of bacteria. Because it is important that old urine never comes in contact with the opening of the stoma, most urostomy bags are made with a kind of anti-reflux valve so that the urine is stored away from the stoma. During the day, a urostomy bag is usually sufficient. It differs from an ileostomy bag in that an ileostomy bag usually has a clip at the bottom through which the stool can be emptied. 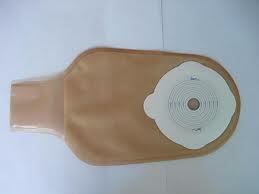 A urostomy bag usually has a small tap through which the urine is drained. It's at night time where the main difference occurs. During the day, gravity drains the urine away from the stoma. Whilst asleep, or resting in bed, the bottom of the bag may need to be connected to some tubing which in turn attaches to some kind of night drainage system - some people use it - others don't. This can either be a large vinyl bag which hooks over the bed frame or a large modified jug placed on the floor beside the bed. You can place it in a wastepaper basket or large shopping bag, etc to disguise it if you wish. In this way, gravity will continue to work and drain the urine away from the stoma so that infection can't occur. If you are planning on going on a long trip and don't want to have to worry about emptying frequently, there are also "leg-bags" available for this purpose. There are many, many different accessories and products designed to help the ostomate extend their bag weartime. It seems to be the goal of every ostomate to get as many days wear out of their appliances as possible - and not just for cost effective reasons. The less time spent worrying about changing appliances, the better! None of the following are essential and a lot of ostomates use nothing but the wafer and bag and get satisfactory weartime from their appliances (myself included) but on the other hand, a lot of ostomates can't get by without them. 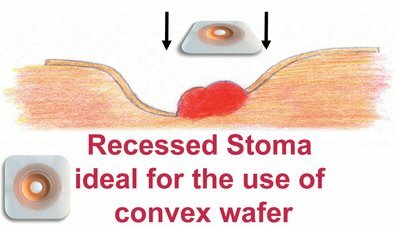 Some ostomates prefer to wear a special belt with their bags and most wafers are designed to accomodate this - they may have special tags for the belt to attach to. Belts, while not being absolutely necessary, help a lot ostomates and make them feel more secure whilst wearing their bags. Skin Preps - These are available from a number of manufacturers and are designed to help lengthen the wear time of appliances. A lot of them help prevent a lot of skin irritation as well. (Please note: there is a product called "Stomahesive Paste". This is not, as the name suggests, a paste. It is designed simply to fill in crevices in the skin to make the wafer adhere more smoothly to the skin). Remember, a lot of ostomates, esp the "old timers" recommend the "less is more" adage - the less you use on your skin, the more wear time you'll get! (and you have less chance of being allergic to the stuff you use). Skin Adhesive Removers - These are designed to help you remove the excess adhesive from your skin whilst changing your appliance. A lot of ostomates just recommend removing the adhesive whilst in the shower - gently use a nail to scrub the excess off. Remember, it doesn't really matter if there is some adhesive left over - the main thing is to get rid of all the stool. In fact, some people say that their next wafer sticks even better if they keep some of the adhesive on their skin from the previous change! For those who prefer to reuse their bags, there are special pouch cleaning solutions available. Deodorizers - There are a number of deodorizers especially for ostomates available. These can either come in tablet form, designed to be taken internally, or made to pop in your pouch to minimise odour. There are also special devices called vents which can either be bought already attached to your pouch or you can attach them yourself. These vents are designed to release the gas buildup in your bag and deodorise it as it passes through the vent. Stoma Patches and Caps are available for those with continent ostomies, ie colostomates who irrigate or those with a Kock Pouch. These look just like little bandaids designed to cover the stoma between irrigations and catch any mucous discharge from the stoma. Pouch Covers - Apart from making your bag look pretty and covering up it's contents, pouch covers have a practical use as well. They can help absorb the sweat that the plastic from the bag makes on your bare skin. There are plenty of manufacturers around that sell pouch covers but I would advise making your own. They are very easy to make - just use an unused bag as a template - it saves you heaps of money and you can use any unwanted scraps of material floating around your home - plus you can use whatever material designs you want. You can also accessorise it with bits of lace, etc to dress it up a bit if you want! (Hint: you may find that t-shirt material works best). Convexity - Sometimes short, flush to the skin or retracted stomas can cause problems with leakage under the skin and so skin irritations develop. A tighter seal than normal is needed around the stoma. One answer to this may be a convex insert. Pouches can come with convexity built into them or you can buy the convex inserts separately. 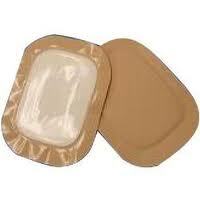 These convex inserts help the stoma protrude a little more and thus direct the flow of stool or urine into the bag rather than under the wafer.